First I designed a label and I even created the tag FTC tag sort of like what was explained in the wonderful post at Duhbe. I don't have an RN number yet, but oh well. After trying the Avery labels and just not being happy with it not centering my labels, I tried several programs that I have but found that most of them wanted to paste my image in like a resolution of 96 where it was created in a resolution of 300. Finally I found that if I created a document with Word and just used columns to paste my pictures it wouldn't re-resolution them where if I created a table it would. And it was good. I had to manipulate the page settings so the labels would fit just right. I set it for 3 columns with no space between. My labels 2.5" and might be two labels like DuhBe makes or just this one that will fold over; I'm still debating. 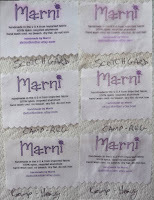 First I will try making my own labels by creating a sheet of fabric that I can run through my printer. I'm using Egyptian cotton in white and freezer paper to create my printer friendly fabric. Make the paper- First I cut a piece of fabric and a piece of freezer paper both a little bigger than 8 1/2 x 11. I accidentally cut it too close to 11 and the fabric way bigger than needed (I was on the phone and distracted... LOL). I did cut the fabric a little bit on the bias which is something that I didn't think of when buying the fabric my fabric is about 12 1/2" but I did turn it a little bit to avoid fraying as much as possible. I placed a piece of scrap flat cardboard on my desk. I placed the fabric on the cardboard then the sheet of freezer paper was placed with the waxy side down on top of the fabric. I ironed the freezer paper to the fabric using high heat. As soon as the iron touched the freezer paper it melted and made little pockets where the iron holes are on the bottom of the iron. I'm thinking that it would be best to place some fabric like a pillowcase on top of the freezer paper before ironing to prevent that. I allowed the fabric and freezer paper to cool completely then cut the fabric paper to 8 1/2 x 11". I chose not to include the pictures here, because it doesn't show more than the words explain. Print on the fabric paper- My printer is an HP PSC1210 xi and I am using HP brand ink. I set my printer to "best" quality and selected "Photo" for paper type. I put the paper in so that the fabric side will be printed on; for me that meant my fabric side was face down in the printer. Print. Let dry for 15 minutes. I cut off the top 3 images and tried to "iron set" the color. I let it cool and actually it sat for more than 24 hour, but not on purpose though :). On the right you can see what the labels looked like hot off the printer. My first experiment was just to rinse the labels in cool water. I swished two of the labels individually for about 45 seconds while rubbing it between my fingers. The result: faded labels. Below are pictures of the labels: The left ones are how they looked right off the printer and on the right is how they looked after rinsing them. The words aren't even legible. Bummer. There is some hope though. While cutting the first three tags, I thought I would use some fray block on the edges. Well I accidentally got a drop of it on part of the ink on one of the tags. It spread a little, but not much. I wondered then if this would set the color just as it sets the edge from fraying. Without further ado I squirted a bunch of it all over a logo tag. It was pretty much dripping and it still had the freezer paper backing on it. I wonder if it would not have ran if the paper were not still on it. Anyway, I let it dry a little bit then ironed it with high heat. It got rinsed in cool water like the previous two. The result: the ink didn't fade and it looked just as it did before the water rinse. It is however much stiffer now and this might not be something that you'd want for a wearable item. Check out the before and after pictures below. I may be onto something here. Then I decided to try a few other things which all seemed to fail. One I tried spritzing water then ironing over and over again, but I got one big blob of water and it ran right away. I also tried a quick soak with no agitation in a Woolite and water solution which faded right away (the yarn ball is where I applied a tiny bit of straight Woolite with my finger and although it did change color, it didn't fade as badly as the rest after the quick soak. It was then ironed and maybe set. It will probably run though once soaked in straight water. Lastly I dipped a label in pure Lestoil. I patted it dry and a little bit of the ink from the words came off on the paper towel. I then ironed it dry but the cloth I put over it when I ironed it didn't quite cover one of the edges and it turned brown, which I'm sure is from the intense heat on an oil soaked cloth. At least it didn't burst into flames! LOL. So then I decided to try using other fabric sealer type stuff I had around. The verdict is still out on these since they have to dry and I will treat them at least twice before rinsing. 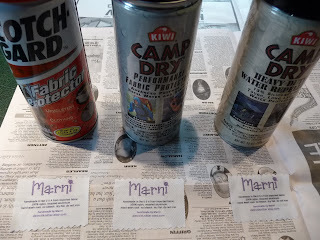 It will take several days before I can determine if any of the three chemical sprays I used on the labels below will be wind up being the winner. So far they look good because they didn't run and they didn't fade. But they haven't been subjected to water yet either. Well now that what I thought would be the ace in the hole failed I am moving on to the pre-treated fabric sheets in the package. I'm using Crafter's Images on Cotton Poplin, which I purchased at Joann. I printed one image and it looked really nice and it stood up to the rinse test. 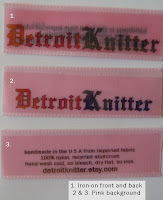 I printed just the DetroitKnitter logo to see how those colors would do and they look great after the rinse. This is the stuff! There are some drawbacks though. I had a horrible time feeding the sheet through my printer a second time for another image and the third time I tried to print on it was a complete loss and I wound up trashing most of the sheet. So you pretty much have just one shot to print on this stuff; at least with my HP printer. One other downfall is that the edges will fray. You can use Fray Check or pink the edges or fold them under and sew though. As you can see by the before and after rinsing photos there was barely any change to the ink and it's very legible! The next experiment involves the iron-on transfer and ribbon. I've been playing with my logo design and "company name" so these images are different. Anyway, I'm using Wilton's EasyImage light t-shirt transfer. I again made up some labels on Word and printed a few on a sheet. This is tricky because you have to remember to mirror the image before printing which as you can see I accidentally did in the picture below. My first attempt was to put a logo on one side of a piece ribbon and the instructions on the other side. This failed. The ink from each side showed through to the other side. Also I had followed Grumperina's tutorial on how to do this and she said I would need to make the background color the same as the ribbon; this was not true as I later found out that the whatever is white doesn't print white rather it doesn't print at all so it's clear around the image. While this would work, I'm not totally thrilled with the waxy, dull appearance around my logo on the ribbon. The paper seemed to feed better than the pre-treated fabric sheets, which I was using earlier, but I still had some issues with it with my HP psc1210. Overall I can say that the happiest I am with everything I've tried is using the pre-treated fabric sheets. IF, I have the need, I may order a yard of the pre-treated fabric from C Jenkins and give that a whirl. I would never chemically treat my own though; that just seems like way too much work!